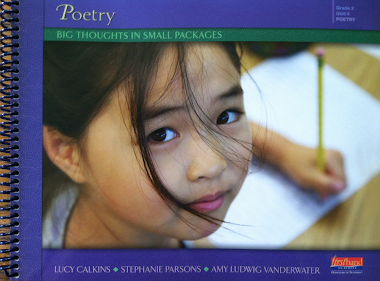 Welcome to my April 2013 National Poetry Month Project. I began this blog for April 2010, when I wrote a poem each day of the month for the first time ever. 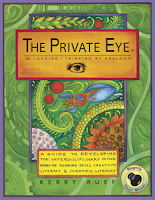 In 2011, I cataloged those poems for easy finding. In April 2012, I took a Dictionary Hike, opening the dictionary from A-Z, writing a poem from a word beginning with every letter in the English language. This year will be something different. My 2013 April poetry project will be called Drawing into Poems. Each day of this month, I will slow myself down, look closely at something, draw it, and take notes around my drawing. I'll photograph and share the drawing and notes here each day. From time-to-time, at least on Fridays, I'll share a poem inspired by my drawings and notes. The purpose of this project is to help me see more clearly and to help me linger on images. My goal is not to become a great artist, but rather to become more in tune with my sight, more deeply connected with the world, more slow, more thoughtful. I am not a person who has spent a lot of time drawing. Cartoons, yes....drawing by looking, no. It is not easy for me to see shadows or perspective or shapes. But I believe that I can learn. And the month of April is going to help...one day at a time. This brief video clip (which I have watched tens of times) helps me believe that I can learn to draw, to see, to write better poems than I do now. Give us ourselves new again. Give us our world new again. A few people have mentioned joining this project, and I welcome everyone - children, teachers, poets, people who spend too much time looking at computer screens, anyone who wishes to just look, see, make marks, and be amazed. Here are a few books I'll be bringing with me through the month, and I welcome you to read and learn with me. And here is my very first slow-down-and-sketch-and-write entry of the month. Students - One grand thing about drawing-while-you-look is that it helps you see so many things you would never notice before. Your eyes slow down. I am going to try to slow my eyes down all month....and this will help me see new ideas for poems, new ideas in surprising places. Try it. Look...and draw. Slowly. 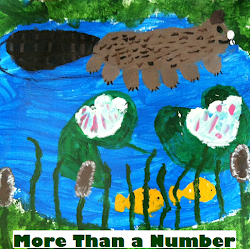 Today I am excited to be starting off the 2013 Kidlitosphere Progressive Poem! Please read the first line here today, and follow along each day of the month. Irene has once again gotten this warm and wonderful community project off the ground. 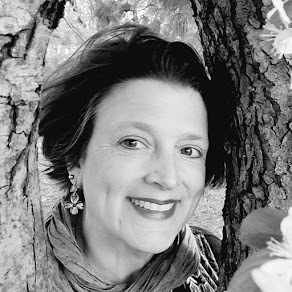 Laura Purdie Salas, over at Writing the World for Kids, is generously offering a Poem Starter video for each day of April. Not only will this be a great way for students and teachers to learn about new books, it is also an opportunity to hear Laura read so beautifully and to receive a snip of inspiration for poems of our own. 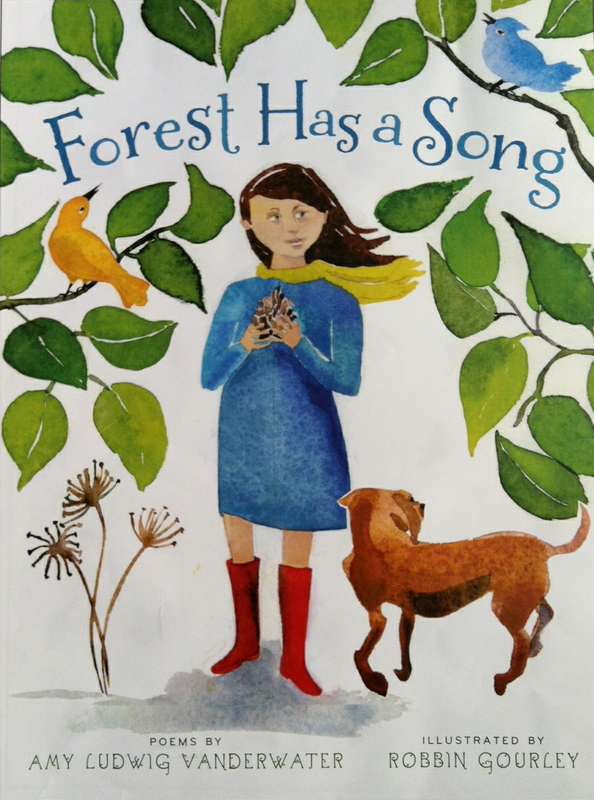 Today she shares the first poem and a Poem Starter from my new book FOREST HAS A SONG. For this year's Poetry Month, I am tickled to be Author-in-Residence over at ReaderKidZ. Over the next couple of weeks, you will be able to visit ReaderKidZ and read a bit about my writing and my life. 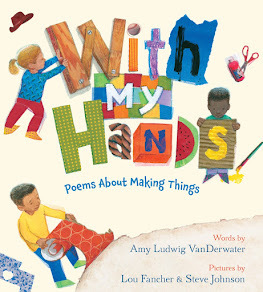 If you haven't yet checked the multitude of National Poetry Month projects in the Kidlitosphere, do visit Jama's Alphabet Soup where Jama has graciously rounded them up from poetry starter videos to poems each day to community projects and student sharing. Let the joy begin! 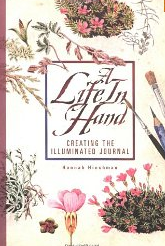 Love the idea of slowing down and sketching to observe, learn, and write. I am writing a poem a day over at http://reflectionsontheteche.wordpress.com and will have my students joining in. We start today with A for acrostic. I will be using all the wonderful resources on your site for support. I'll be joining the progressive poem on day 11. Wonder where it will be by then. Where will your footsteps lead us? Happy April! If only April would allow me to slow down! Maybe I'll take a month of sketching for inspiration in...JUNE! My project is a cousin of yours, though, when I think about it. Just using different sorts of images for inspiration! Amy, what a wonderful project! I love the mindset video you posted--one of my favorite. And the books you mentioned. You might also want to consider Julia Camerons, The Artist's Way as you pull on resources about slowing down to look more closely. I look forward to following this project with you and letting it add to my inspiration. What a wonderful project. I love the idea of slowing everything down to see things better. I have been fascinated with patterns and geometry in nature, and your pineapple is a great example of that. Beautiful! I enjoyed the Ted talk about the mindset, so important to know for all, & for teachers, too, Amy. Your project is going to be wonderful. 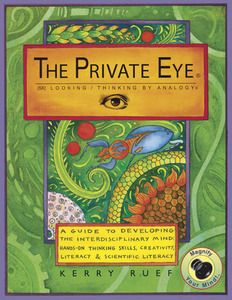 I've used the Private Eye, the Hinchman & Gregory books with my classes in the past. They are helpful, as is a loupe, for seeing! Your first sketch is a lovely beginning. Those 'everyday' objects' are good things to choose! Thanks for all, including the first line in the poem-opens up the world, doesn't it? Great start to Poetry Month, Amy! I was lucky to discover these last two reference books (by Edwards and Franck)decades ago. And haiku a few years ago - which also requires one to be present in the moment and really look. Thanks again and happy April! Wow I love that pineapple! You are so inspirational. I can't wait to follow you all month! You are off to an amazing start, Amy. Wow! I love the pineapple! I love the idea of slowing down to see. That's what the painting is doing for me. Your example is such a powerful example of slowing down to notice and think, Amy. 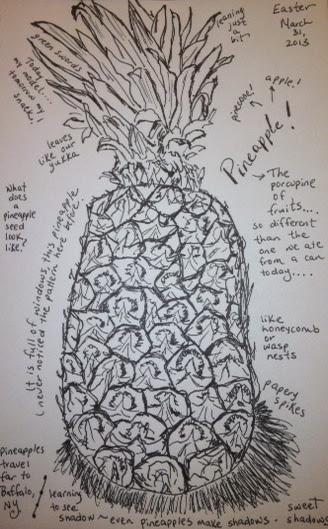 Love the idea of the pineapple as the "porcupine of fruits"! Nice idea. I even like your pineapple drawing! I'm doing poetry every day too, on the A to Z Challenge again this year. Mine is with photographs of lobster boats though! Maybe I should draw one! Your pineapple sketch is really lifelike for a non-drawer.....I think maybe you are further along than you will admit!! I LOVE Betty Edwards' book and got SO much out when I used it back in the early 80s. I actually did learn to see differently...for a while. Like Renee says, you really have great ideas! Thanks for sharing. Can't wait to check out the other books, too. If you haven't tried the exercise in Drawing on the Right Side of the Brain where you draw your hand without looking at the paper.....it's really freeing. And then....you look at such an interesting jumble of lines....but you feel like an artist. I love your drawing...especially your descriptive words! What great exercise! Wasps nests, papery spikes, shadows...lots of neat sounds are coming out of your ssssketch, too!